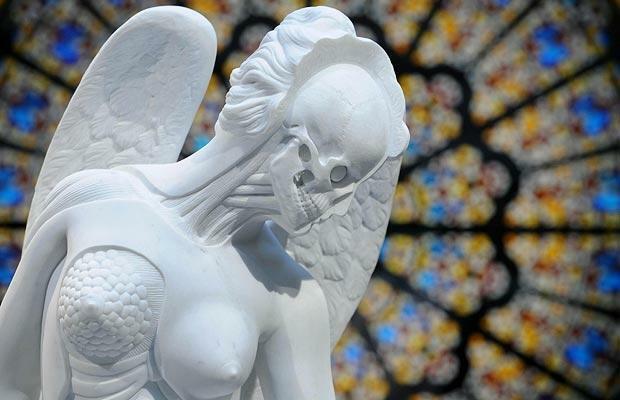 Damien Hirst's "Anatomy of an Angel" shown from the chest upwards: a white marble sculpture of a naked angel, looking down and to the right. Portions of the surface are cut away, as in an anatomy model, to reveal part of the skull, the muscles of the neck and shoulder, and the soft tissues of one breast. In the background, out of focus, is another of Hirst's works in the style of a stained-glass window. the scaffolding of what we are, displayed. at once angelic, animal, machine. as are the silent contours of the skull. 4: axle-span is my translation of the Old English term eaxlegespanne, a unique compound found in the OE poem The Dream of the Rood. It comes from eaxle, ‘shoulder’ and gespann ‘joining, fastening, binding’; in context, it probably refers to the horizontal bar of the Cross.